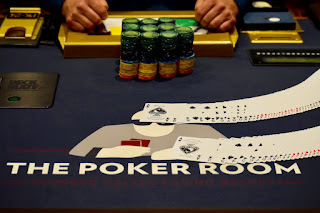 Players can buy in to today's Day 2 @WPT Rolling Thunder $3,500 Main Event through the first two hour-long levels, with reg closing at 2:15pm when cards go in the air to start Level 11. 17 players bought in to Day 2 before cards went in the air, pushing the overall field size to 400 as Matt Savage set Day 2 in action. All players have a single Day 2 buy-in available until Level 11 starts.